Do we take our troubles to the Lord with hopeful faith and confidence in his help? People in desperate or helpless circumstances were not dissatisfied when they sought Jesus out. What drew them to Jesus? Was it hope for a miracle or a word of comfort in their affliction? What did the old woman who had suffered greatly for 12 years expect Jesus to do for her? And what did a inconsolable father expect Jesus to do about his lost beloved daughter? Jesus gave hope where there seemed to be no human cause for it because his hope was going to God. He spoke words of hope to the woman to catch light the spark of faith in her, “your faith has made you well”! And he also gave divine hope to a father who had just lost a beloved child. It took considerable bravery and risk for the ruler of a synagogue to openly go to Jesus and to invite the scorn of his neighbors and kin. Even the hired mourners laughed at him in scorn. Their grief was devoid of any hope. However, Jesus took the girl by the hand and delivered her from the grasp of death. In both instances we see Jesus' personal concern for the needs of others and his readiness to heal and restore life. 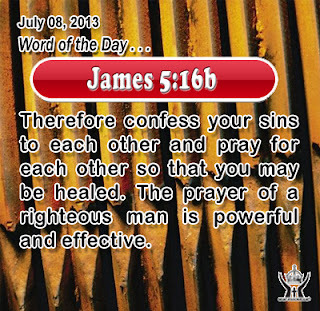 James 5:16b Therefore confess your sins to each other and pray for each other so that you may be healed. 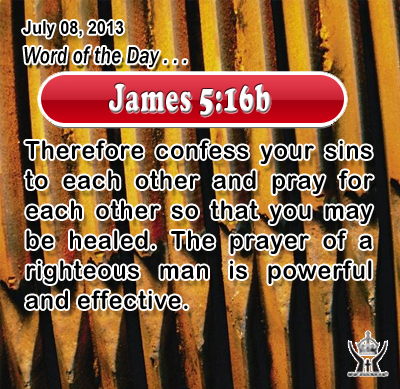 The prayer of a righteous man is powerful and effective. O loving Father, God of holiness and grace, please forgive us for our sin. Please lead us, dear Father, to the group of your children with whom we can lay down our trouble of sin in confession and know that they will pray for our forgiveness and lead us to greater confidence in the power of your grace and the might of your Spirit to help us overcome the sin in our life. In Infant Jesus' name. Amen. 18While he was thus speaking to them, behold, a ruler came in and knelt before him, saying, "My daughter has just died; but come and lay your hand on her, and she will live." 19 And Jesus rose and followed him, with his disciples. 20 And behold, a woman who had suffered from a hemorrhage for twelve years came up behind him and touched the fringe of his garment; 21 for she said to herself, "If I only touch his garment, I shall be made well." 22 Jesus turned, and seeing her he said, "Take heart, daughter; your faith has made you well." And instantly the woman was made well. 23 And when Jesus came to the ruler's house, and saw the flute players, and the crowd making a tumult, 24 he said, "Depart; for the girl is not dead but sleeping." And they laughed at him. 25 But when the crowd had been put outside, he went in and took her by the hand, and the girl arose. 26 And the report of this went through all that district.